Compared to some of its larger, louder neighbors on Barracks Row, EatBar seems cozy and restrained. During the spring and summer months, when revelers pour out of The Brig, a beer garden down the street, this hip neighborhood bar and gastro-diner is content to do its own thing. That’s not to say that EatBar lacks flair; it greets patrons with an iconic mosaic made out of cassette tapes that spell out the word “EAT.” Most of these 7,200 tapes were donations from the staff’s personal collections, but in order to complete the project, Chef Nathan Anda and company had to find extras on eBay and at garage sales. EatBar’s predilection for meat is no surprise, given Anda’s background as a butcher; he is the brains behind the popular D.C. butchery, Red Apron. He shows off his talents on a fine charcuterie platter that includes thick slices of sirloin ham and various Italian sausages ($21 for all of the five meats, which can also be ordered a la cart). Under the heading of “Beasty Things,” Anda serves up a juicy Spider Steak (the same as hanger steak) saturated with a sharp and zesty chimichurri sauce ($12). The steak, like most dishes at EatBar, is a small plate, albeit a generously portioned one. Just a few of these make for a more than satisfying meal. With no offering above $20, the menu is highly conducive to grazing. And lighter items on the “Green Things” portion of the menu, such as a pleasant arugula salad with grated Grana Padano ($8) are ideal palate cleansers between bigger bites. EatBar actually has much in common with its down-the-street neighbor Ted’s Bulletin, another new old-fashioned diner that specializes in modernized versions of comfort food classics. But Ted’s, with its large dining room and sometimes long lines, as well as its “adult milkshakes” and homemade pop tarts, is bigger, brasher and more direct in its homage to the old classics. 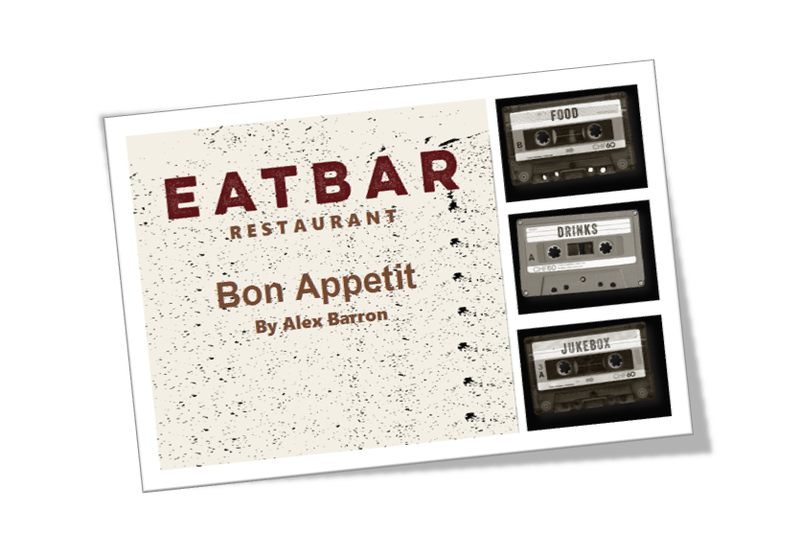 By comparison to its boisterous neighbor, EatBar is atmospheric and chic. It also happens to have a much deeper bar, presided over by wine director Brent Kroll and beer director Greg Engort. The wine list is especially impressive for a restaurant of this size, with over one hundred bottles in stock, including thirty that may be ordered by the glass. In addition to the jukebox and the space age zinc bar, several of the menu’s offerings are decidedly retro. Take, for example, the Chicken and Waffles ($20), perhaps the only entrée-sized dish, a savory and sweet delight topped off with house-made maple butter and honey hot sauce. Anda’s Beef Fat Fries ($5.5) are a new and improved take on disco fries, a garlicky blend smothered in his own Alabama white sauce – a better version of the kind of gravy usually served over biscuits at diners across the south. Clearly, Anda is not one to shy away from high-calorie indulgences: his signature dessert, Lemon and Ricotta Donuts ($7), are little pillowy puffs of sweet orange-infused dough. Just over a year since its opening on Barracks Row, EatBar has been fully embraced by the locals. Neighboring bars on Eighth Street are bound to attract bigger crowds, but for a glass of wine and a plate of fries, there is no better option than Anda’s unassuming outpost. With the exception of maybe the Capitol Building and a few of the monuments, the EAT mural is simply the best selfie backdrop in town.